The goal of this curriculum was to meet the needs of the mission or small parish for a unified curriculum, flexible to varying numbers of students of varying ages. The entire curriculum repeats every four years, each time with increasing depth. A child born in the parish will have the comprehensive material repeated three times during his Church School career (but in greater depth each time); a newly arrived child will have a full and comprehensive education even if he joins the parish as a teen. 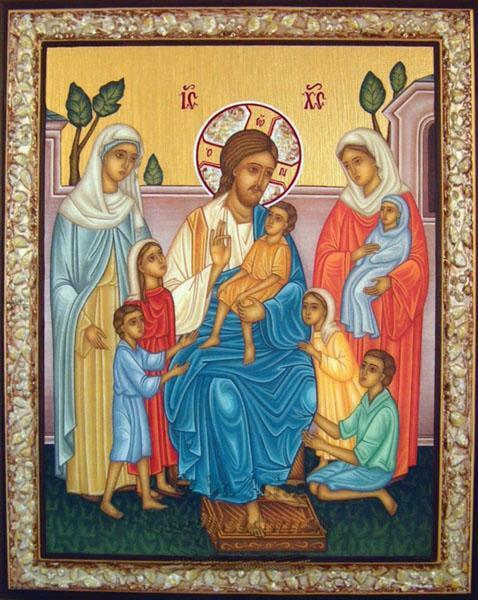 The material for the curriculum was drawn over 2 decades of Church School teaching and direction by myself, Dr. Pat (medical doctor, but with a love of Orthodoxy and children), in both an OCA parish, St. Matthew's, and an Antiochian parish, Holy Cross, both here in Maryland. Many teachers contributed crafts and ideas to the lessons, and much material xeroxed over the years and used and reused from a vast number of sources has been incorporated. The hope was to provide the best of the best -- craft ideas, lesson ideas -- that could be found in Orthodox and other sources. As the decades went forward, the source of many of the original materials has been lost. If you, the user, discover your own copyrighted material -- please accept my apologies and I will either reference it or take it down (your choice) as soon as informed. Each year, as the materials were presented for use by the parishes, they were reviewed by our parish priest for accuracy and appropriateness. Each lesson has been tested by real teachers with real children in both parishes. No materials I have personally developed are considered by me to be copyrighted, but are shared here for your use -- as a full curriculum or as individual lessons or ideas for your home or Church School. The curriculum follows a time-line view of history, beginning with the Old Testament year. From the hundreds of stories of Jewish history, the parents chose the most influential or important from either a historical or liturgical point of view to present to the children. There are only so many weeks in a year, and most of our Church Schools close down for the summer to avoid teacher burn-out and tiny class-size. Of course, in the opening exercises of each Sunday, other important stories (Enoch, Deborah, Samson – to name a few who were reluctantly set aside) can be shared with everyone. You will see a sample Church year schedule, which you can copy and fill in your own dates for the year, your own teachers, etc. The second year studies the Life of Jesus (i.e., the Gospels) in detail, presented again chronologically for the younger children, while the teens have a “parables” focus to learn Bible study techniques which will be important as they go away to college. This year is rich in feasts and studies the events on which many of the sacraments are based. The latter part of the year is scheduled around the liturgical calendar and lessons may need to be reordered around the movable feast of Pascha, so that the story of Zaccheus falls on Zaccheus Sunday, etc. There are a few lessons of parables and the Lord’s Prayer that can be moved; they are not filler to be deleted, but their lessons are not chronologically tied to the story of the life of our Lord, nor tied to the liturgical calendar. The third year is academically the most challenging – Church History. Again, it is presented chronologically, with the “most important” events showcased. For the smallest children, the curriculum almost looks like a “saint of the week”, which is not bad in that it introduces even our toddlers to these great Christians. Of course, by the middle school and teen classes, the material is much more detailed, ending with the formation and present-day status of each of the national churches. Again, feel free to move the lessons around; for example, the lesson for St. Gregory Palamas is scheduled to fall around his feast day during Great Lent, but that’s a movable date and may require a change of date. The fourth year was not a part of the original curriculum. It is entitled “Epistles, Feasts, and Sacraments” and seeks to include material that is important but does not fit into a historically chronological presentation. The epistles are read every Sunday but frequently given only scattered attention in Church School (e.g. in the life of Paul as places he visited); likewise, the feasts and sacraments, while presented peripherally elsewhere in the curriculum (e.g. Theophany and baptism in the Life of Jesus when Jesus is baptized), are showcased here. The feast lessons are scheduled to be the week before the feast itself to prepare the children for the services; by definition, the placement of these lessons may have to be changed for the movable feasts each four years – just move them around! Otherwise, the epistles and sacraments move in an orderly manner through the year. This year is a chance to tie together many aspects from the more historical years and see direct application in our Church life. Facilities, well, a bit sparse? Meeting in a stairwell or a closet? Can’t do detailed crafts? We’ve found it easy to put a minimal supply for each class in a plastic bin which can be carried in each and every Sunday. For craft time…consider a year-long scrapbook. Copy the coloring page for the younger children from the Parents’ Guide, mount it, decorate it, and place it in a binder or folder for the child to keep as his “book.” Older children can decorate a page with his or her own illustrations from the lesson. Teachers burning out? Consider a rotation of teachers even for a very small church school -- no one, not even the Church School director, wants to miss coffee hour every Sunday! Small group of children of wildly different ages? Choose the levels that work best for the majority of the children, use what you need, and vary it from year to year as the ages of the children change. This is a curriculum that is meant to be easy to teach, easy to implement. But, it is not an easy curriculum. Four-year-olds studying Church History? Many times we sell our children short. If they can learn the details of the life of Sleeping Beauty, why can’t they learn the life of St. Nina of Georgia? And, by the time they reach the teens, they are ready to assimilate the saints they already know and move into a historical perspective of Church Councils and missionary efforts. And, as our children leave home for college or career, they will be grounded in the faith, ready to continue in the Orthodox Church as adults and defend it in our ever more secular society. May any lessons you choose to use in your home or Church school bless your children as they grow in the Lord!